A limited number of paintings are offered for sale; please enquire if you are interested in something you see on this site. Otherwise, most images are available as giclee prints on high quality medium gloss paper. Prices range from about $60 to $275, depending on size. The largest size print, of the racehorse Leave Seattle, is 18" x 36", and would require custom framing. Insured shipping generally ranges from about $9 to $15 within the U.S. There is also California sales tax on sales within the state, currently a whopping 9.75%. I welcome the opportunity to do a commissioned drawing or acrylic painting of your animal – dog, cat, horse, or any other species. My preference is to meet the animal and get some first-hand sense of his nature and spirit, and then work with photos to create a portrait or full-body work. If the personal encounter is not practical, then working from good photos may be possible. Parameters of pricing would include: the desired size and medium of the work, time requirement if you have one, and whether or not travel is required. In general, a smallish drawing, 8" x 10", would be around $250-$300. Larger work, such as a 24" x 36" painting, unframed, would be around $6,000. Various parameters influence pricing of commissioned work. Please contact me at linda_jaques@earthlink.net if you are interested in a print, original painting, or commissioned piece. And take heart in knowing that a significant portion of every sale goes directly to help real animals in need. 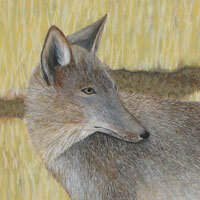 This is one of my objectives as an animal artist – to give back in this particular way.